City plan of Dallas, Texas celebrating the centenery of Texas's independence from Mexico. Commercial & Street Map of Dallas, Texas. 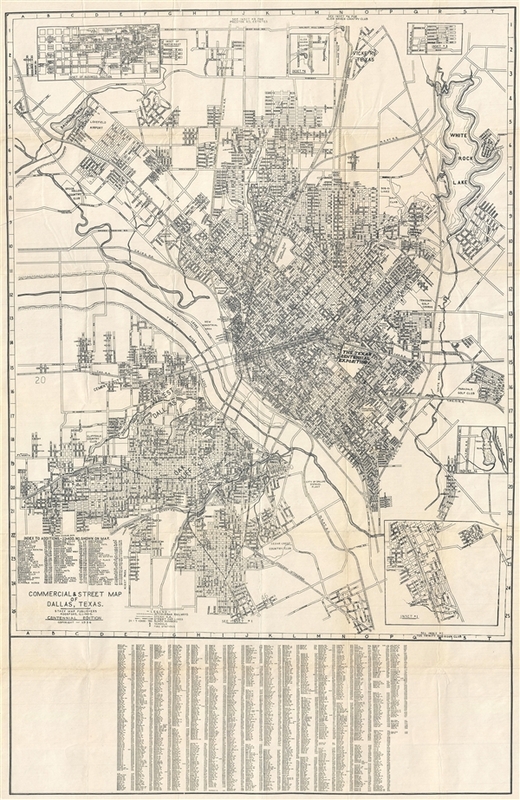 This is a beautiful 1936 map or plan of the city of Dallas, Texas issued by Stacy Map Publishers. Issued to celebrate the centenary of the Republic of Texas, it covers from Love Field south to the Cedar Crest Country Club and from Bachmans Dam east to Parkdale Golf Club. The map is incredibly detailed, noting individual streets, parks, railroads, cemeteries, rivers, lakes, and other important landmarks. The location of the Texas Centennial Exposition at Fair Park is noted. The Texas Centennial Exposition celebrated 100 years of Texas’s independence from Mexico. With over 50 buildings constructed just for the fair, the exposition is considered to have saved Dallas from the Great Depression. A legend and an index are included in the bottom left. A street index is also included along the bottom of the map proper. An inset of the business section of the city as well as four other insets are included. This map, the centennial edition, was issued by Stacy Map Publishers of Rockford, Illinois in 1936. Very good. Minor wear and creasing along original fold lines. Overall toning. Minor verso repairs near edges along fold lines.